The Injury Prevention Advisory Committee (IPAC) is a volunteer network of professionals and community members that has been working together since 1990 to prevent injuries in Hawai‘i. IPAC serves as an advisory group to the Hawai‘i State Department of Health Injury Prevention and Control Section (DOH/IPCS). Injury prevention in Hawaii is graphically displayed in a brief history of the IPAC-IPCS partnership. The Injury Prevention Advisory Committee also includes a Steering Committee (IPAC SC) with members who are focused on policy development and implementation. More information on IPAC members and the IPAC SC is included below. 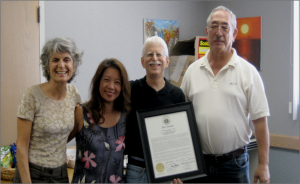 Here in Hawai‘i, we have made great strides in preventing injuries through the cooperative efforts of government agencies, voluntary and professional organizations, and numerous other community partners. 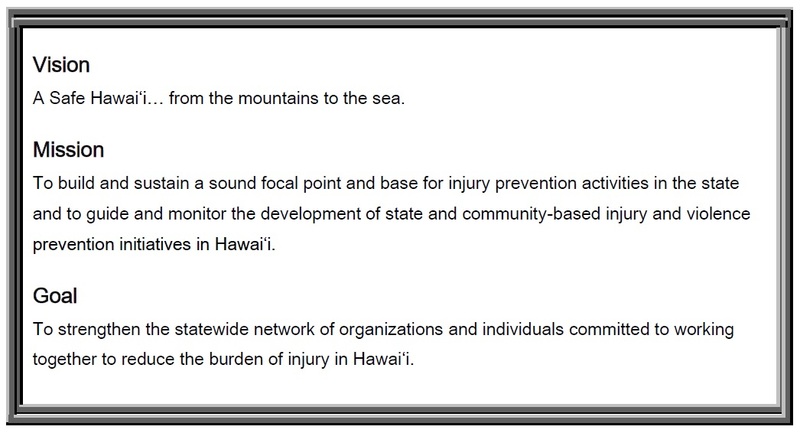 IPCS/IPAC key accomplishments reflect the kinds of injury prevention strategies that have been used in Hawai`i to address complex public health problems based on the Spectrum of Prevention. There is much more we can do to prevent injuries so that people in Hawai`i have the opportunity to live to their full potential. Establish legislative and organizational policies such as helmet laws and fall prevention screening that reinforce safety practices. For more information on how to get involved in IPAC or other injury prevention efforts, please contact us at ipcp@doh.hawaii.gov or call the Injury Prevention and Control Section on O‘ahu at 808-733-9320. Working together, we can accomplish what none of us can do alone. IPAC members include representatives from each island as well as statewide governmental and non-governmental agencies. Members represent public health, public safety, criminal justice, first responders, insurance companies, mass media, healthcare plans, urban planning, hospital/trauma/medical centers, medical professionals, researchers, state athletic associations, survivors, and other interested individuals. The primary purpose of the IPAC Steering Committee (SC) is to provide guidance and direction for statewide injury prevention efforts and to serve as the Policy Committee for the Centers for Disease Control, Core Injury and Violence Prevention Grant. The IPAC Steering Committee is scheduled to meet every other month at the EMS & Injury Prevention Branch Office from 12 pm-1:30 pm. During these meetings, the SC works with IPCS staff to identify priorities, make recommendations related to the Hawaii Injury Prevention Plan, and help ensure that IPAC members are actively engaged in monitoring and implementing HIPP. The Term Limits – 2018-2019 describe how IPAC, the Steering Committee and IPCS work together to make progress in preventing injuries.